Carter stands in front of his 100-year-old resort, which may be about to grow. Seattlites and Tacomans for the last 100 years have escaped to the Green River Gorge east of Auburn to experience solitude, broken only by the echo of falling water. One of the many destinations near the gorge is the Green River Gorge resort, where each week Jim and Linda Carter, who have welcomed guests to the old recreation area for the last 11 years, regularly get cabin requests even though they have no cabins. The Carters only have a campground, snack bar, and trail system that winds down into the gorge. But that may change before long. Linda is reseeding parts of the meadow and preparations are under way to install utilities to serve what they initially believe will be about six cabins slated for construction this fall. Looking around their domain, Jim believes there could be 30 cabins some day, more than adequately restoring the resort’s overnight tradition. She envisions cedar A-frames with lofts and fireplaces, nestled among the firs and renting for about $60 per night. The Carters generally rent camping on a monthly basis space to about 40 people who are temporarily in the area for logging work, for example, or who are waiting to move into a home. 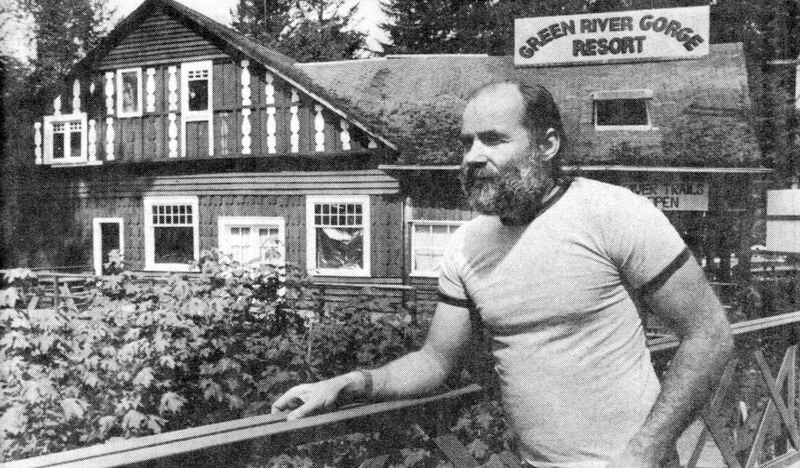 Some resort buildings have survived the years, like the old lodge overlooking the gorge, where Linda said chicken dinners were a 1920s specialty. The Carters now use it for their home and manufacturing facility for underwater salvage equipment. Jim, a Buckley native and one-time abalone diver off California’s Santa Catalina Island, started a business with Linda called Carter Liftbags, which they transplanted to the gorge. The lodge’s snack bar is the only public part of the building. It is currently open on nice weekends only through June 1, when daily operations will begin. Yet visitors are always welcome to spend the $2 fee to descend onto the gorge trails. There, sprays of water cascade down like bridal veils along the downward trek to the river. Here, in the center of the 14-mile-long gorge, the Green dances to a raucous beat of adventure. Kayakers shoot through waves as hikers toe their way along weathered logs that bridge the narrow canyon paths. The Green River remains mostly pristine, though many lovers have carved their initials into the sandstone along its banks. Twenty years ago, the legislature established the Green River Gorge Conversation Area and put it under the administration of the Washington State Parks and Recreation Commission. Today, the state controls more than 2,000 acres in the gorge. Developed state parks at Flaming Geyser and Kanaskat-Palmer anchor the western and eastern ends of the gorge, respectively. Yet all property owners in the gorge area have been sympathetic to the state’s preservation efforts, including holders of large tracts like Weyerhaeuser, Burlington Northern and Black Diamond’s Palmer Coking Coal Company, gorge area manager Ralph Mast said. Every biennium the state spends $500,000 to continue land acquisitions, while large companies have left stands of virgin timber throughout the corridor that can be seen from the river. But besides the real estate interests, Mast said, there are lots of other people interested in maintaining the gorge, ranging from scout, church and boater groups that participate in the annual trash haul to archeologists and historians who are rediscovering the past. Green River Community College students and the Black Diamond Historical Society are involved in ongoing studies of Franklin, a ghost town north of the resort that died decades ago. Yet the valley’s coal mining legacy remains very much alive. Just over the hill, Palmer Coking Coal is actively using its John Henry Mine. Within the gorge itself, black lumps cover parts of the old Franklin road leading into Hanging Gardens State Park, where visitors may visit a screened 1,000-foot deep mine shaft that was constructed before 1910 to mine coal 500 feet below sea level. Across the river, the Smokey Fields site reveals the continuing powers of mine fires beneath the surface. Down on the river, the Franklin Hot Springs, warmed to 94 degrees as recently as two weeks ago, gurgle out of an old mine shaft that been blazing for years. A few private homes still surround the resort area today even though Franklin’s dwellings were hauled out on the last train. But at one time, when the railroad spur carried Franklin coal to Puget Sound, 1,200 miners found pleasure in and around the resort area in five dance halls, fishing ponds, and in the baseball meadow just across the river from the resort. Though the state now owns Franklin, Mast said that there are no plans to buy the resort as long as it is providing a public service. Park development, however, will continue along the gorge. The next major improvement, Mast said, will be the addition of 50 more camping sites at Kanaskat-Palmer, a park that opened about six years ago. The Carters’ own building plans hardly compare with those for the new Salish Lodge at Snoqualmie Falls, Linda said. “That would be too Bellevueish.” And the river, with its steelhead and salmon runs, remains. Linda said she would miss its thunder is she ever left the gorge. And that, said Mast, is why the state established the conservation area. “If it is not preserved for public use,” he emphasized, “they (the public) will lose access to it. It’s true. I would love to make the trek down some day.